The kappa is a creature from the Japanese mythology. When people wander too close to the water in which he lives, this water goblin grabs them and pulls them in the deep water until they drown. According to the legend kappas have a weakness for pickles. The handmade decorations of this katana depict a kappa and unsuspecting wanderers. 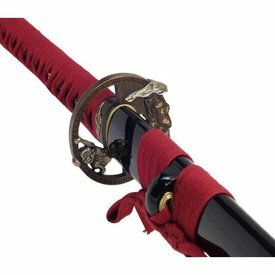 Besides the colour of the katana the fuller is also special because it begins 10 cm above the hilt (tsuba). This katana has a length of 102,5 cm with a blade of 73 cm and a grip (tsuka) of 29 cm. 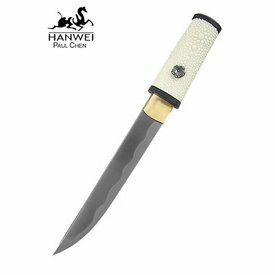 It weighs 1120 g. The blade is made of Damascus steel from 12 times folded 1045 carbon steel of 8000 layers in the Shinogi-Zukuri style with a fuller. The grip wrapping is made of red cotton in the classical Hineri-Maki style, underlaid with genuine shagreen. 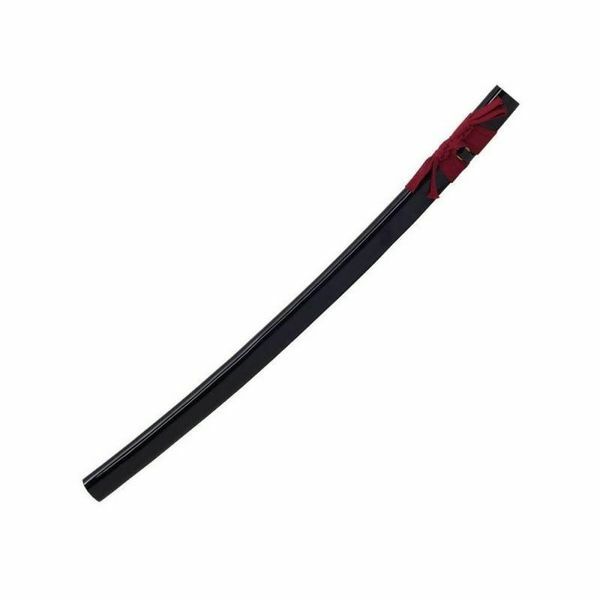 It has a black high polish lacquered scabbard (saya) in the Kuroro style of wood. The long tang (nakago) of the katana is fixated in the grip with two bamboo pins (mekugi). A fabric protective cover is included.